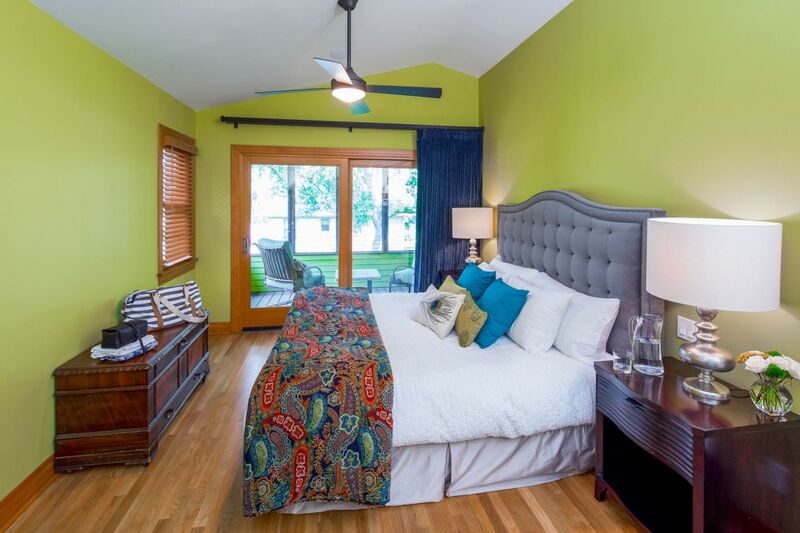 Susan Terrell and Don Brode fell in love with the Zilker neighborhood while renting a home on Josephine Street. After some time living in the neighborhood, they decided to buy there. They found their 1956 home on Jessie Street by word of mouth—tipped off to the original owners who were looking for a young family to sell to. But not just any family. A family that would honor and love the home just as much as them. And that’s what they saw in Susan and Don. The living room features a piano nook and a custom designed and built buffet inspired by 1930's French Art Deco. After purchasing the home in 2003, Susan and Don’s family grew with the birth of their daughter Lily and son George. 10 years later, their home was feeling a bit small. 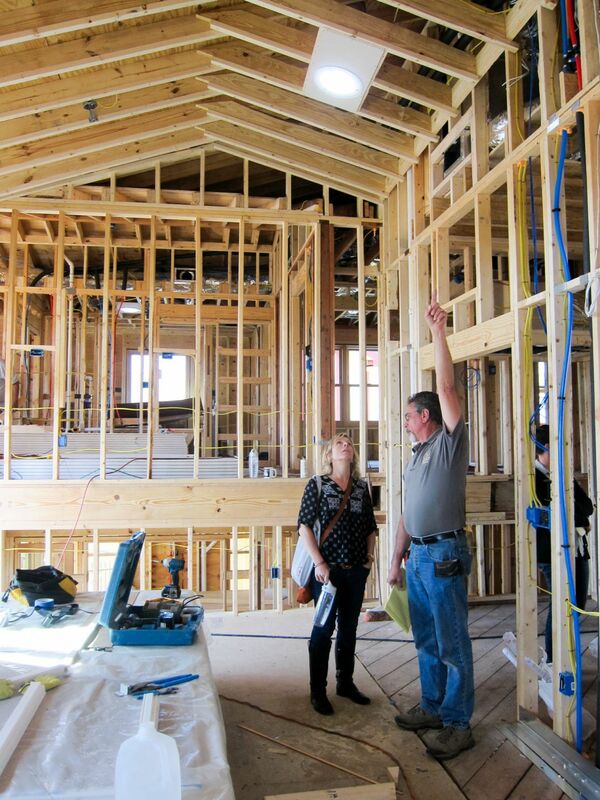 They explored purchasing a different home (and even entertained building a new one altogether), but ultimately decided to stay put and renovate the home they loved and brought so many wonderful memories. 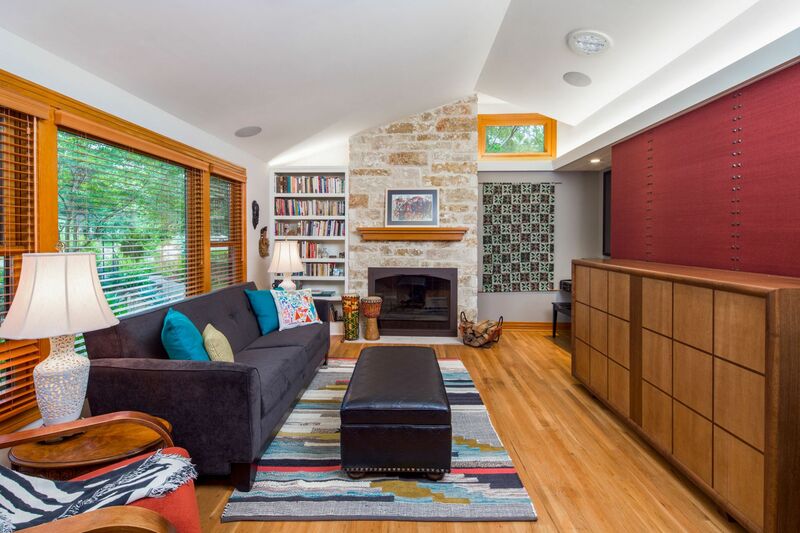 As it happens, Susan and Don had hired CG&S to renovate a small bathroom in the 1990’s, but it wasn’t until they walked through a CG&S home on the 2013 Austin NARI Tour of Remodeled Homes that they could see the full extent of what a whole house renovation looked like. 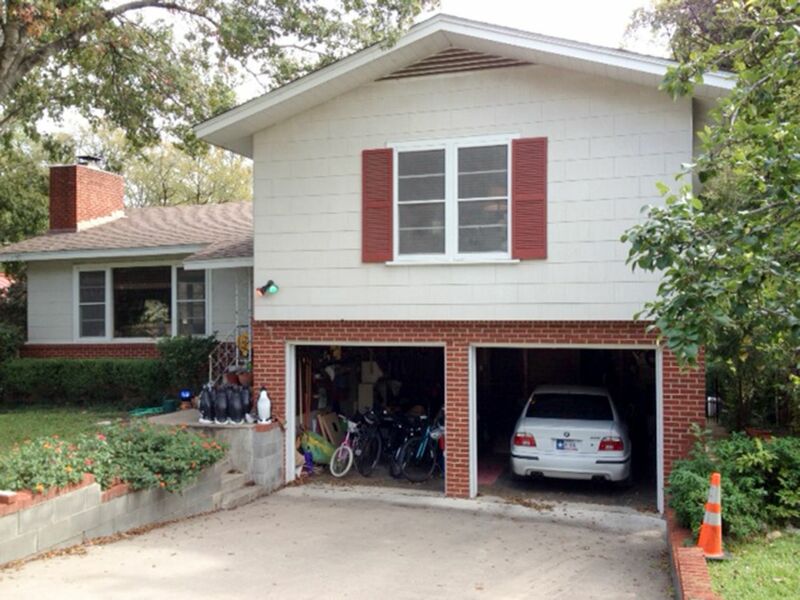 That home was also in the Zilker neighborhood, and belonged to good friends. So they called us. The home has an interesting way of retaining its traditional elements and pushing them against moments of the contemporary. The style never quite becomes traditional, nor feels outright contemporary, nor settles into a more generic transitional state. It simply looks and feels comfortable with itself, expressing a variety of stylistic aspects that combine to make a unique affect. 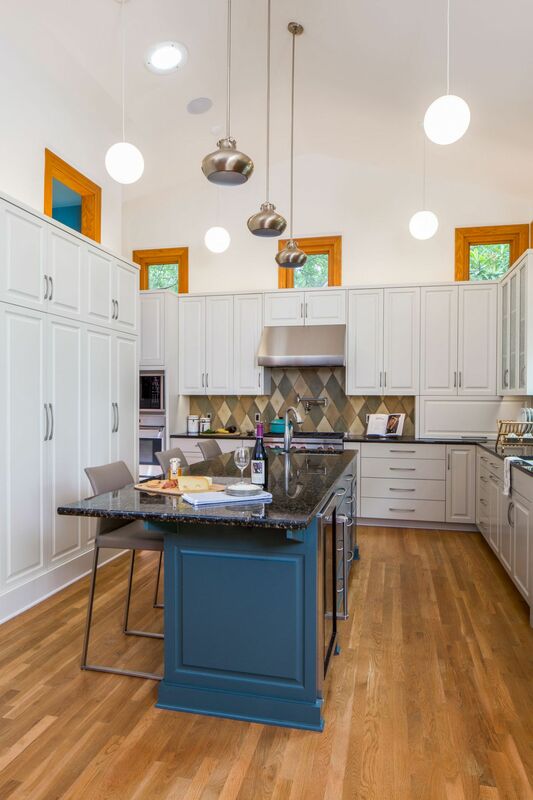 Stained oak trim matches throughout the newer spaces, and contrast with the modern, simple, geometrical presence of the pendants that seem to float in the space of the open kitchen. And yet the dining space is enclosed; red oak floors—also matched throughout added space—run up against a pop of accented color at the kitchen island. It’s these elements’ way of surprising each other that makes the home so charming. The home is replete with whimsical touches in the kids' wing, like this loft, and secret passages to the hall outside. Susan and Don wanted to enlarge the home while keeping its street presence as similar to the original as possible, which proved tricky owing to the home’s unusual offset stacking of its three floors. The stacking was something that really attracted them to the house; it was nostalgic and reminiscent of the 1950’s Midwest housing stock Susan grew up with. Preserving this feeling was therefore paramount. Better than that, even, was that the layout the stacking imparted suited their lifestyle perfectly. Form was function in their case. These parameters provided a straightforward design path. We didn’t need to fundamentally transform the home, but rather enlarge it, provide spaces for more amenities long on the bucket list, and clarify a few aspects of the design and functional patterns. If it’s not broken don’t fix it, right? The middle level, on the left side of the floorplan, shows the dedicated living space, intimate dining room, and expanded open plan kitchen with access to the full width kitchen deck. The upper level, reached from a half length stair, is dedicated to a line of bedrooms. The hall has plenty of built-in storage, a shared hall bath, and a "decompression zone" that precedes the master suite with its own screened porch at the back of the addition. We needed to make a fairly substantial addition harmonize with the existing look and vibe of the house. We raised and pushed back the ridgeline that faced the street to make more space for the new open vaulted kitchen; this extension makes a dramatic, spacious difference while subtly changing the appearance from the street. It's almost as if nothing happened. To balance this push-back, the ridge line perpendicular to the street that runs the length of the 3rd level was also raised, and pushed back as well to accommodate the new master suite and screened porches. We expanded the tiny landing of the original entry into a proper porch as well, providing roof cover and a wider stair. These changes made it feel as if the house was literally growing from its original form, scaling backward and outward, like any other organic thing would. Houses can be alive! 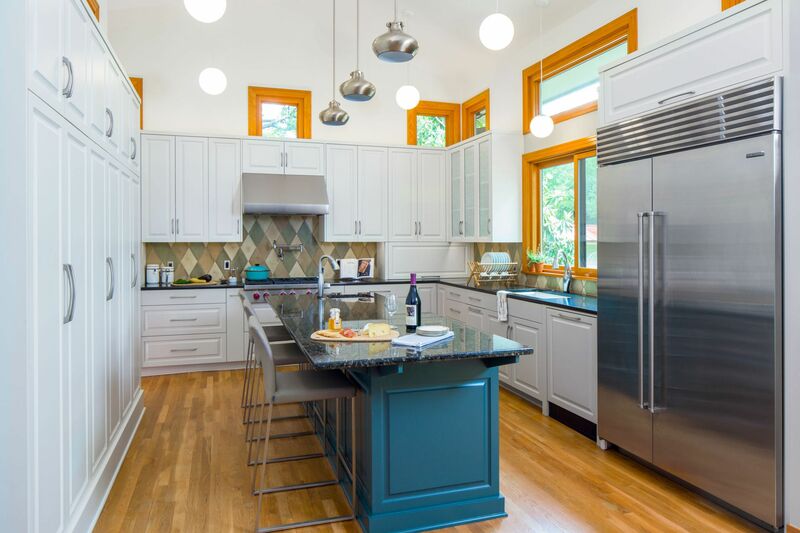 The kitchen was expanded and changed to an open plan, grounded by a central, granite-topped and color accented island, with a new entrance to an open back porch. The old oak floor of the original was perfectly matched and flows throughout the added space. The higher ridgeline allows the space to soar, illuminated by new clerestory windows that feature custom oak trim that carefully matches that of the original home. The high ceilings made recessed lighting ineffective, so pendants descend instead and float within the space, adding a simple geometric counterpoint to the more traditional, staid cabinets and backsplash. Under-cabinet lighting proves excellent task lighting, and skylights augment the overall lumens, washing the kitchen in diffuse, clear, bluish light. The dining area opens to the kitchen but is enclosed on three sides, creating an intimate experience. The living room retains the comfort of its original oak wood floors, which were matched in the addition. 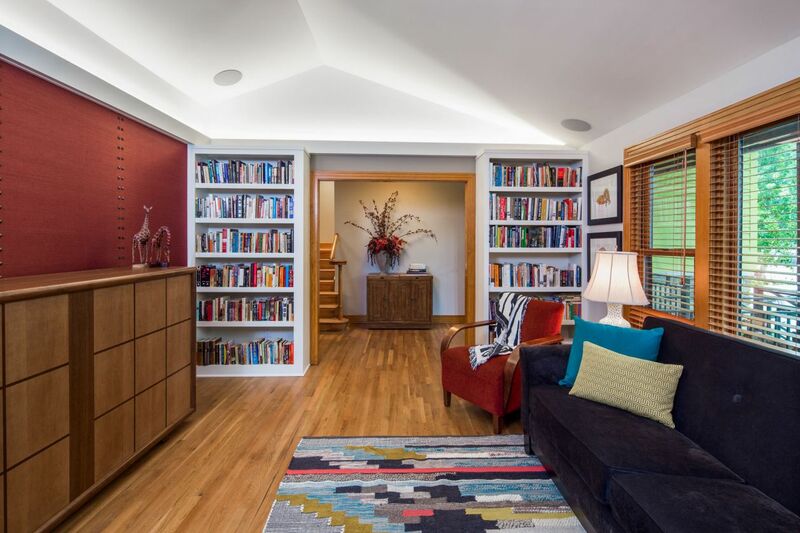 Built-in bookshelves provide plenty of storage. A fireplace accompanies a couch for reading or watching television. The highlight of the room is the custom designed and built buffet inspired by 1930's French Art Deco. Cove lighting gently illuminates the space. The area labeled "Crawl Space" hints at the area and shape of the addition. The utility room is truly versatile, with a dutch door that keeps the dogs contained while allowing them to be monitored, support for food and water, and built in cubbies and a bench for coat & boot storage for human foot traffic. A door leads to an outside runner deck that connects to the back porch &, and of course the space accommodates the home's laundry functions. It's a true mud/laundry room. And then right around the corner, a totally awesome beer station. We designed a cabinet to hold two different size kegs, with glass panel cabinetry above to hold collected glassware. Two things that seem to be at odds, maybe. But this space is truly flexible, as well. It functions as a homework space, music station, TV watching world, and play area. It suits the mood, and the task. And there's access to the back screened porch and the outdoors, which is probably more interesting anyway. Before we could start on the addition, we had to build an extension of the foundation. Space was so tight though that we had to knock a way clear through to the back yard via the garage to make a way for heavy machinery to access the site. A rather unconventional if not amusing adaptation to limiting circumstances. Here you can see the footprint of the addition as delineated by the new form work, and the framing that sets the stage for the split level addition at the back of the house on the left as well as the new open kitchen on the right. This view shows what happened when the parallel ridge line was raised, making the kitchen space vaulted and taller, matched by the perpendicular ridge which makes room for the 3rd tier addition. The house suddenly has much more bulk, but this is tempered later by the addition of porches, providing a more graceful connection to the back yard. adding more room, air, and light to central living and cooking areas, while providing new opportunities for storage, new bedrooms, and accounting for functions that had always been desired, but never provided for. All while respecting and enhancing the homes original style and spirit.